For most of us, the thought of flying conjures images of long lines, cramped seats and questionable food choices — if we are lucky enough to get some food. 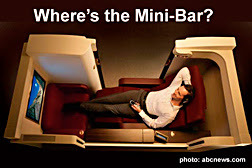 But for those who can afford it, airlines are going out of their way to add amenities in their first-class and business-class cabins. New seats, new entertainment systems and a bevy of additional services unheard of just a few years ago are popping up as airlines battle each other for lucrative customers. Emirates Airlines plans to spend $50 million in the next 18 months to upgrade its first-class product. Its new in-flight entertainment system, which will also be available in coach, will offer more than 600 channels of entertainment on demand. First-class screens will be a whopping 23 inches. Singapore Airlines has a news system called KrisWorld. Passengers can choose from 100 movies, 150 television shows, 700 CDs, 22 radio stations and 65 games. Welcome to the latest round of airline seat wars. In 2006, Delta announced its intention to be the first U.S. carrier to offer lie-flat seats in its international business class. American Airlines introduced its plans for upgraded seats in March of this year and United unveiled its plans last month. United's "First Suite" offers a 180-degree lie-flat seat, a five-course meal, a laptop power source, a personal video screen with nine channels and a videotape player with a choice of 14 feature films. Go ahead and dip the chairs in solid gold...and have bikini-clad Hooter girls slicing Ruth's Chris Steaks with sterling silver knives. Serve all-you-can-drink Guiness, and even throw in a massage to work out those kinks in your neck. Do just about anything you want to entice fatcats back to first class. But as the airliner sits stranded on the tarmac waiting for a slot to depart into a sky clogged with your company traffic plying the hub-and-spoke system, it can be scientifically proven that those high rollers up front will be delayed EXACTLY the same amount of time as the unwashed cattle in back. If the U.S. carriers really want to win back our respect and confidence, maybe they ought to find a way to simply fly more direct routes on schedules that they can actually keep. And do away with their completely insulting overbooking policies, and while they're at it, come up with some fare structure that is the same price across the board, regardless of the day you buy the ticket. An empty seat is an empty seat, and it costs the same to carry one pax through the air. Do these things, and maybe we'll come back in droves. But to simply gloss over the weaknesses of U.S. air travel with fancy first class seating is an insult to any passenger who flies in back...which happens to be the vast majority of their customers. So in today's airline management culture, it's apparently just fine to piss off the masses to cater to the few rich and famous who can still afford to sit up front. Kind of sounds like the carriers are taking their cues from Bushco...screw the middle class, pamper the elite. And while they were lounging around coddling their fat cronies, the paying public was growing very weary of commercial air carriers. 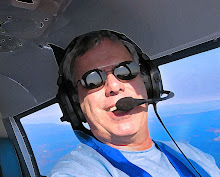 Which might expain why general aviation aircraft sales are off the charts. Charter is booming, air taxi is just around the corner, and fractional ownership of a business aircraft really makes great financial sense. Lots of options out there to avoid the legacy carriers, and the airlines know it. If they weren't scared that those high fare passengers were going to defect to GA in droves, they wouldn't be trying so hard to keep them.